International businesses across the United States and Europe are making a beeline to exit the Iranian marketplace ahead of the reimposition of harsh U.S. sanctions that Trump administration officials have been warning will target any company that defies America's call to cut ties with the Islamic Republic, according to multiple U.S. officials briefed on closed-door meetings held over the past months. U.S. diplomats have been holding a series of meetings with top international business and banking leaders to spell out the Trump administration's new sanctions policy, which will come into full force in early November. Since the United States withdrew from the nuclear deal, 31 European and Asian firms in the Global 500 have announced their intention to exit the Iranian market. Those companies include "France’s Total, Airbus, and PSA/Peugeot, Denmark’s Maersk, Germany’s Allianz and Siemens, Italy’s Eni, Japan’s Mazda and Mitsubishi UFJ Financial Group, and BP from the United Kingdom," according to the Foundation for Defense of Democracies. Multiple insiders familiar with these discussions told the Washington Free Beacon the Trump administration has been making clear that if anyone sides with Iran—and a handful of European nations are angling to keep ties with Iran open—they will be smacked with some of the harshest sanctions in recent memory. Major banks and corporations had been plotting with some European allies to skirt the new restrictions prohibiting business with Iran, but are said to have ceased these efforts in recent weeks after tough warnings from top U.S. diplomats, sources said. The meetings are being held as former Obama administration officials and their allies hold a series of counter meetings aimed at helping European nations and top companies skirt Trump's new sanctions. This rogue diplomacy—including that of former Secretary of State John Kerry, who has held a series of meetings with top Iranian diplomats—is being met with indignation by the Trump administration, which has accused the former administration and its allies of running a shadow diplomacy campaign aimed at undermining Trump. At stake in this diplomatic battle is the future of the Iranian economy, which has already been pinched since Trump abandoned the landmark nuclear deal and reimposed sanctions. The tumult in the Iranian economy has sparked a series of popular protests that many predict could topple the hardline Iranian ruling regime. U.S. Ambassador to Germany Richard Grenell is one of several top diplomats who have held what insiders described as fruitful meetings with European companies and banks. During these tense talks, officials are said to have won a series of guarantees these entities will fully comply with Trump's sanctions. However, the successful diplomatic campaign by Trump's top diplomats has been undercut by German leaders and other European nations hoping to create a scheme aimed at circumventing new U.S. sanctions. Multiple U.S. officials, in conversations with the Free Beacon, confirmed the diplomacy has paid off, saying a range of top corporations and banks have already pledged to abide by the new sanctions after being informed the Trump administration will be taking a drastically different approach than Obama's. "There's a difference between the reality of the business community and the political pronouncements of politicians," Grennel told the Free Beacon, explaining that international leaders are beginning to recognize that Trump means business when it comes to the new Iran sanctions. "The Americans are watching," added another source, a senior U.S. official familiar with how discussions have been playing out. "The reality is every single business is automatically and easily turning from Iran. It's working. No one is standing up to us" in the private sector. This shift comes after months of tough diplomacy with top banks and corporations that, for some time, were aiming to figure out schemes to circumvent new sanctions. Still, top German officials and others in the European Union continue to plot sanctions-evading techniques, calling for an alternative to SWIFT, the international monetary system that brokers cross-border financial transactions. The EU, in a bid to keep Iran afloat as its economy tanks, recently approved an aid package worth more than $21 million. As the Nov. 4 deadline for sanctions inches closer, former officials and allies of the Obama administration continue to hold briefings with European diplomats to undercut Trump's Iran policy. Tensions have been building since last October, when a cadre of European ambassadors met in a closed door session with Senate Democrats and top former Obama administration officials. The discussion centered on undercutting Trump's Iran policy and preserving the nuclear deal. "Senior Obama sanctions officials have conducted briefings for European diplomats and bankers to educate them on how to evade U.S. sanctions in order to keep money flowing to Iran and keep the JCPOA [nuclear deal] alive," said one veteran foreign policy adviser who is close to the White House and briefed on these matters. "The EU's idea of using European central banks to process one-off payments via SWIFT, betting Treasury wouldn't have the stomach to impose sanctions on a central bank or Swift board members, was entirely Team Obama's," the source said. "What they didn't count on was how willing President Trump has been to touch all kinds of third rails in trade and sanctions, sending shockwaves through every central bank around the world. Trump has the stomach to do a lot more than Team Obama thought possible." The Trump administration could disconnect Iran from SWIFT, according to multiple insiders who pointed to recent non-committal statements by top U.S. financial institutions CitiBank and J.P. Morgan about their position on disconnecting Tehran. On Capitol Hill, Grenell and team Trump are winning plaudits among Iran hawks for their steady diplomacy to win international banks and corporations to their side. "Obviously there are places where lawmakers are still concerned about the Trump administration's commitment to maximum pressure, and some of that spilled into the open last week with the report that Treasury Secretary [Steve] Mnuchin is pushing for a waiver to let Iran stay on SWIFT," said one senior Senate foreign policy staffer who works on these issues but was not authorized to speak on record. "That's a non-starter as far as the Hill is concerned," the official said. "But you can't fault them on the enforcement side of things. It took months and months, but after the hard work of Treasury officials below Mnuchin and ambassadors like Grenell, our partners and adversaries understand that absolutely no one is safe. If you violate our sanctions, you will face catastrophic extinction-level fines." Richard Goldberg, a former senior Senate aide who helped craft original Iran sanctions legislation, said the Trump administration's strategy is paying off. 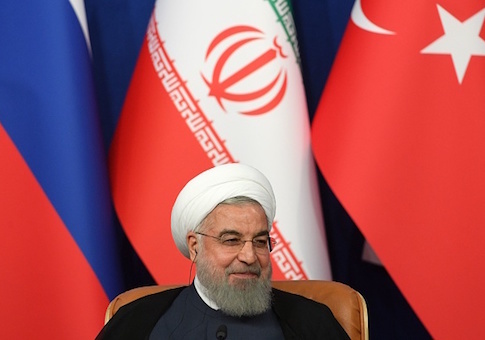 "Before May 8, there were very few voices arguing that America could successfully re-impose sanctions on Iran without the support of Europe, Russia and China," said Goldberg, currently a senior adviser to the Foundation for Defense of Democracies. "The echo chamber had even convinced most opponents of the JCPOA that sanctions were only successful last time because of allied support," said Goldberg, who first advocated for the current policy in October of last year. "With the rial in free fall, oil exports plummeting, companies fleeing, and domestic unrest accelerating, it's becoming clear the echo chamber was wrong." "One test remains, however, and that's SWIFT," Goldberg explained. "If the President orders the Treasury and Justice Departments to go all in against the banks on the board of SWIFT, he'll be on his way to maximum pressure."